Went up to see how the allotment looked and was delighted. The shallots have sprouted like crazy, the new garlic has got another cm or so of growth, the gooseberries are in full flower, the Red Start redcurrant is covered with flower buds, most of the old blackcurrants are too and the rhubarb is starting to shoot upwards. Not to mention the transplanted tree has now opened its first leaves and is showing blossom buds. If it couldn't get enough moisture then I think it wouldn't have made it this far. No sign of the potatoes so no earthing up to do yet. Must go up with the hosepipe, the rake and the carrot seeds. Best news yet - new raspberry canes are appearing, and not just on the autumn ones! Another cold day after a scathing frost, but not as bad as yesterday. By the afternoon it was slightly better, and so I risked going up to the allotment and playing with onions and carrots. 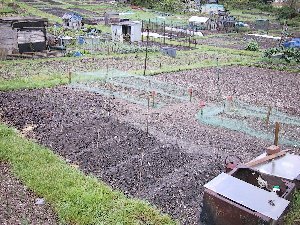 There are now three rows sown, one with pelleted Autumn King carrots (one sown every 2-3" so shouldn't need any thinning), one with pickling onions, and then half a row each of Nantes frubund and spring onion white lisbon. Well they are supposed to companion plant well, assuming the beggars grow! Trampled down on the lines with my foot, as the chap at the National Veg Society stall said to do to carrots last year at BBC GW. Watered a lot of things, including the rhubarb, all the new plantings and all the alliums. This should wash the growmore in. Not exactly 100% organic yet again, but I'm not about to waste the box I've bought, and I'm only really concerned about pesticides. Some of the onions look like the bulbs are growing already. Must keep them watered. 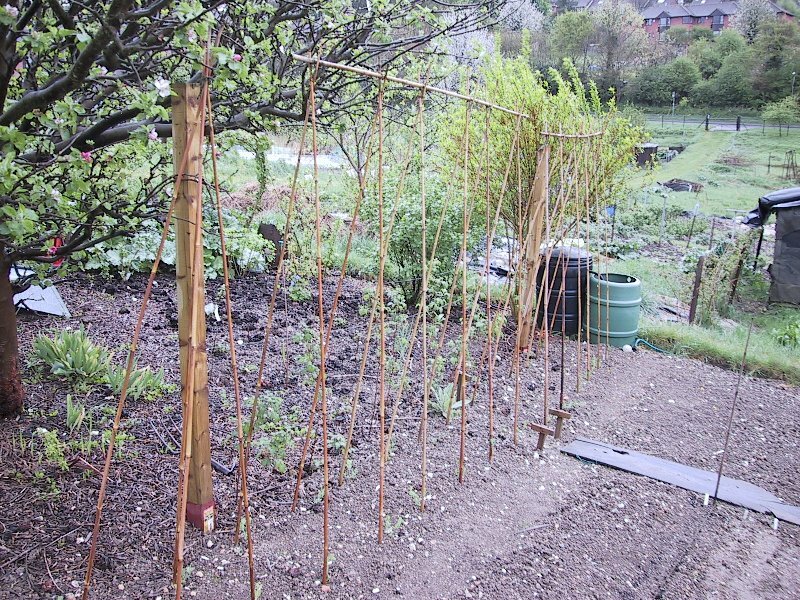 Made my arms ache today by taking all my 7´ bamboo canes up to the allotment and making sweet pea/bean supports. It was tying the tops together that was the hard bit! Then went about weeding. Got rid of a fair few dandelions and Chris appeared with her petrol strimmer, and did her plot, several near it and mine. So at least I don't have to worry about the paths for a bit. Watered the rows of sowings. Wonder how long they'll take to come up, given the weather. If at all (she says, thinking of last year´s carrots!). Put manure in rings around the fruit bushes like they had at Wisley, and decided to weed the couch out of the manure heap. Tricky job, as the stuff had got quite a way in. Think I got most of it. 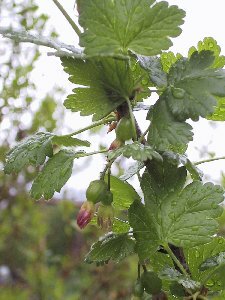 Gooseberries humming with bees. All eight gherkins have germinated as have three (so far) of the cerinthe. Moved the gherkins out of the propagator so they don't get drawn. Realised at 3.50 that I had about 10 minutes to get to Focus to get more bamboo canes. Ran. 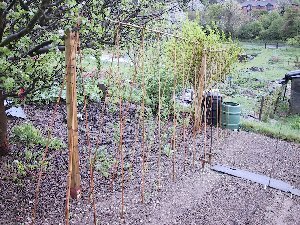 Achey arms or not, went up to the allotment with the canes and most of my sweet peas and finished off the supports. Needed all of the new canes, so there are 28 up. The last four are in a wigwam and stuck in the Bramley, so I can see tree climbing to get the flowers in my future! Planted the sweet peas, mostly in blocks of like colour and occasionally two to a support as I was running out of canes. They are 4" high or less, and growing side shoots, so should be well away if we don't get any more horrible frosts like last Monday and Tuesday. I will plant beans (runner and climbing French) up these too, so hopefully will get both flowers and pollination from this. Hot day. Went up to allotment taking the hosepipe up and filled the butts. Also took the opportunity to shower a fair few plants while I was at it. My logic went, either I'm going to cripple my back yet more by filling them, turning off the water, carrying watering cans about for half an hour then filling them back up again, or I´ll just use the hose on the plants in range while its on. It´s indiscriminate sprinklers after all that they don't want folks using. so I soaked the rhubarb in the hope it will actually grow some, and all the fruit bushes, and the raspberry canes and the new sweet peas. Used the can to soak everything else. Went up with cabbages to plant them and forgot to take the silly collars with me. Oh well. Put the posts in for the netting and watered stuff. Had another go at getting the cabbages in at the allot. Planted the minicoles where I was going to plant the caulis, since said caulis are now fried. Then spent what seemed like two hours battling with the netting. Had to move the posts several times until the darn stuff would reach the ground and let me peg it. Good Friday dawned clear, and up I went up again with the rest of the cabbages after the services. Bit chilly, due to a stiff breeze, but wasn't too bad up at the allotment. I did go up with sun block and a hat on, though. Realised that the Savoys take up a lot more room than the minicoles, so only managed to put five in a dice pattern by the minicoles. Put another four along the top of the spring cabbages. When the springs are out, Ill be able to put broccoli in that bed. It´s got enough netting. Spent an hour or two weeding the bed and the edge of the grass, so it´s a lot neater now and doesn't have so many weeds. Had another battle getting the net on properly again. There is one net and plenty of posts left, for the main broccoli bed. 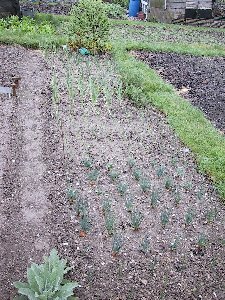 Planted the smaller tray of onion sets along the borders and in the gaps in the existing allium bed. It´s now pretty well full, apart from the downhill side where I could get about 5 in if I'm lucky. With 72 in the other tray, things are going to get inventive. Nice day again. Went to allot with bucket of compost, carrot seed, lettuces and some of the onions. Planted four Webbs in between the savoy cabbages and then three more in a line along where the marrows will eventually go. They should be well out the way by then! Planted seven romaines as well, so I should have plenty of lettuce! 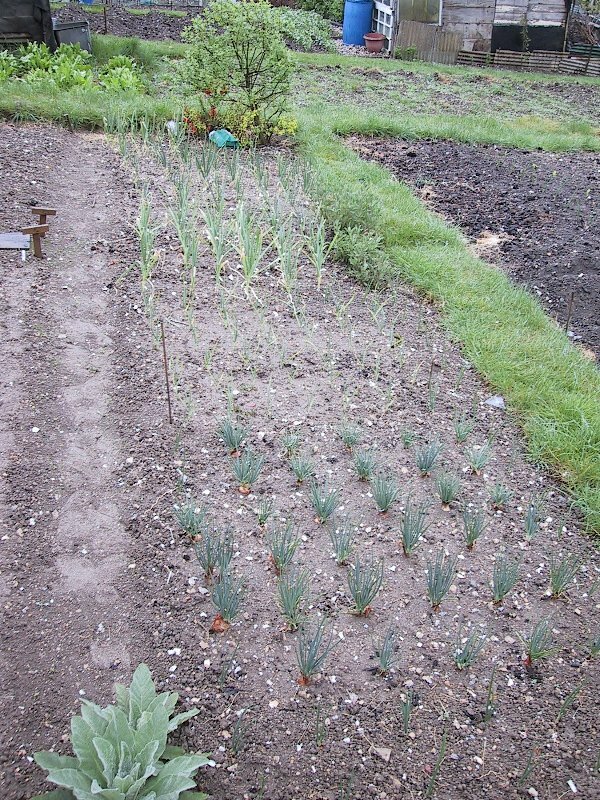 Planted the onions in a line opposite the lettuces, to delineate the beds. They are along the edge of where the leeks will go, so shouldn't mess up my rotation. Still have 54 left! Still no onions or carrots up, which puzzled Chris as hers are coming up. Think the capping of the seedbed may have something to do with it, and I will attempt to keep it damp so the seedlings can get through. Hoed up a long, deep hole in the bed for the next line, filled it with compost and watered it. Planted the Carrot flyaway in that, covered with more compost and soil. Looks quite good, and Ill certainly know where the row is! Shouldn't have capping trouble either. Several potatoes were poking through so I earthed them up rather more. Worked right past sunset and went home after I couldn't see much any more. Rhubarb is coming on now, and the blackcurrants are covered with flowers. The cabbages have all perked up nicely and the minicoles are already coming on a treat. Derrised them all again, though. Once bitten or rather fleabeetled. Hopefully after all the cold weather we've been having they won´t be as plentiful as last year. Loads of surprises have grown over my weekend away. Went up in the dampness after work to look at the allot and I do believe I have some carrots up. Amazing. Something's decimated the lettuces though. Must sow more. The cabbages are doing fantastically. Took photos, as the contrast was flat so its easier to see. Pulled some rhubarb and promptly forgot to eat it for tea. Still can´t believe the tripover apple´s doing so well. The others are out too, with the Bramley being pathetic as usual in an off year and the russet looking lovely. Crunchy eater not as flowery this year either. Cabbages have taken off. And I have little tiny gooseberries everywhere!